If you don't know them and still developing GUI using JSP and JSF then you are missing a lot and you will fall behind in the race with young Java developers, who knows these frameworks well. Anyway, now that you have come here, you will find a lot of free online courses to learn React and Angular online by yourself. I know, some people don't like free courses, mostly fearing that they are inferior quality and plane waster of time but that's not always the case, particularly with free courses on Udemy. I have found that many instructors initially make their paid courses free because of promotional reasons so that more and more students can join them and they can get a lot of ratings and reviews bot build the of social proof. There is nothing wrong on that as you get a chance to look at those courses for FREE, but you should also provide honest reviews and ratings, which is what many instructors expect. Once you enrolled, it will remain free for your lifetime. Also, once they reach their promotional targets they convert their courses to paid and that's why sometimes you click a link saying free course, it's not actually free. The point here is that the quality of the courses is often what you get from a paid course on Udemy because they are the paid courses which are temporarily made free. Anyway, if one of your goals is to learn React JS or Angular this year then you have come to the right place. 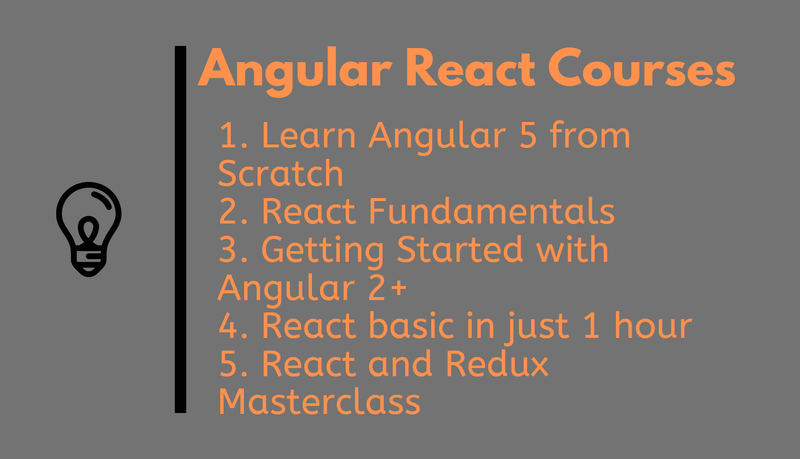 In the past, I have shared some of the best online training courses to learn both Angular and React and today I'll share some of the courses which are FREE. Anyway, without wasting any more of your time, here is my list of some of the free courses to learn Angular and React frameworks for web development. This is an hour-long crash course to learn the basics of Angular 5 version. This might seem a bit old but Angular 5 is still very popular despite the launch of Angular 7. Talking about the course, it has got on average 4.3 rating from close to 44,000 students which are impressive and speaks about the quality of the course. A Big thanks instructor Gary Simon for creating this course and keeping it free for all programmers and web developers. Talking about the social proof, the course has got on average 4.3 rating from close to 15,000 students which is quite impressive. A big thanks to instructor Edvinas Daugirdas for creating this course and keeping it free. This is another great free course to learn Angular on Udemy. In this course, you will learn how to build a simple but real-worth application with Angular. Along the way, you will also learn about how to use some of the most common Angular features like components, directives, forms, HTTP, and more1. Talking about social proof, this course is also a 4.2 rated course from closed to 30,000 students which is quite impressive. A Big thanks to instructor Ryan Chenkie for creating this course and keeping it free for web developers. Along the way, you will learn about key React concepts like State and Profs, event handling, nesting and reusing components and how to transfer data between parent and child components. The course has got on average 4.1 rating from close to 46,000 students on Udemy which is very impressive. It's not easy to maintain such a high rating for a large number of students. A big thanks to instructor Leo Trieu for publishing this course and keep it free for all of us. This is another free course to learn Angular on Udemy but rather longer than all previous course. It is packed with 3.5 hours of content and overall major fundamentals of the Angular framework. You will learn how to get up and running with Angular and how to create an application using Angular 5 and beyond. Talking about the social proof, the course has got on average 4.4 rating from almost 18,000 students and learner, which speaks a lot about its credibility. A Big thanks to instructor Edwin Diaz and Coding Faculty Solutions for creating this course and keeping it free for programmers. This is another short and concise course from Udemy to learn React and Redux. The course is packed with 2 hours of content and covers both React and Redux. The best part of the course is that it teaches you how to write decoupled React.js and Redux code, which is very important for a real-world application. Talking about social proof, this course has got on average 4.1 rating from around 8000 students, which is not bad for a free course. A big thanks to instructor Mateusz Grzesiukiewicz for creating this course and keeping it free. This is another course to learn Angular framework on Udemy. The course is free and contains around 2.5 hours of content. It is best to learn how to develop single page apps with Angular. In this course, you will learn how to set up your development environment using Angular 2 and Node.js and then learn how to create an Angular application from scratch. Talking about social proof, the course is one of the highest rated free Angular course on Udemy. It has got on average 4.5 rating from close to 6500 students. A Big thanks to instructor Grant Klimaytys for creating this course and keeping it free all the way. One of the common doubt among web developers are is deciding between Angular, React, and Vue.js. All of them are good and has their own advantage and disadvantage but this course provides you a unique opportunity to decide for yourself. In this course, you will build a React App, an Angular App, and a Vue.js app. After that, you should be able to understand the difference between them and decide which one is best for you. Talking about the social proof, the course has got on average 4.3 rating from closed to 42,000 students which is very impressive and speaks a lot about the quality of the course. Pluralsight is one of my favorite places to learn new things, as it offers access to more than 5000+ courses for a monthly fee of just $29. It's like the Netflix of the software developer. Just like Netflix you keep on watching movies, you will find learning a lot of stuff on Pluralsight. Talking about this course, it's one of the most popular course to learn Angular 2+ in Pluralsight. It is also very comprehensive and covers Angular quite well. Only thing is that this course is not entirely free, as you need Pluralsight membership to access this course, But if you are looking for a comprehensive course to learn Angular, this is the course you should join. A Big thanks to instructor Deborah Kurata and Pluralsight for this awesome course. React is one of the world's most popular libraries for creating modern web user interfaces. The best part of React is Component and its covered in this course. The course has got 118 4-star ratings and has more than 4 hours of content, which makes it a good course to learn Rect end-to-end. But, Again this course is not free and you need Pluralsight membership to access this course. Btw, if you are the first timer, you can still access this course for free by signing up for a 10-day free trial which provides you 200 minutes of free watching. At last, a big thanks to instructor Liam McLennan and Pluralsight for creating this course. That's all about some of the best free courses to learn Angular or React framework. As I said, it's imperative to learn these frameworks for web developers but it also important for full-stack Java developer. Not only they allow you to create a single page web application but also streamline the way you create web pages. Thanks for reading this article so far. If you like these free Angular and React courses then please share with your friends and colleagues. If you have any questions or feedback then please drop a note.